Dimension Stone Consulting - Hager-Richter Geoscience, Inc. : Hager-Richter Geoscience, Inc. Laboratory testing by ASTM and custom designed procedures and evaluation of physical properties of building stone on office buildings around the U.S. 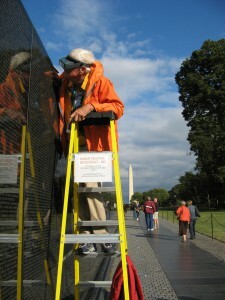 Analysis of cause of cracking in Vietnam Veterans Memorial, Washington, D.C. 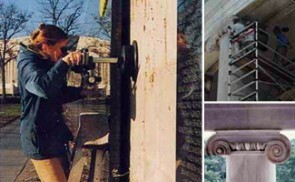 Examination of cracked marble in column capitals of the Jefferson Memorial, Washington, D.C.
Our Dimension Stone Consulting portfolio includes investigations of the Vietnam Veterans Memorial and Jefferson Memorial.